It’s not quite a convertible, but it’s the next best thing. Owning a car with a sunroof adds that wind-in-your-hair thrill to any drive. And the larger, the better. More and more people are opting for cars with a panoramic sunroof, industry watchers say. Here are seven of our picks for the best cars and SUVs with sunroofs, from the tiny Honda Fit to the gigantic, panoramic sunroof on the Ford Flex. You don’t have to look hard to find a sunroof car. The challenge is deciding what, exactly, you’re looking for. 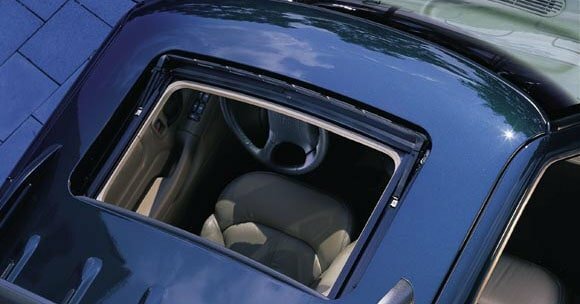 Do you want a large, panoramic sunroof, or a simple sunroof or moonroof? (These two features are virtually the same in today’s vehicles.) Keep in mind that to get a sunroof, you may end up paying a lot for a package that includes other luxury options. Two other things to keep in mind when shopping for cars with a sunroof: quality and safety. Some car owners have experienced shattering sunroofs in recent years; the unexpected explosions have affected cars from at least 12 manufacturers. And a leaky sunroof is an expensive problem that can leave you with a car that smells like mildew. When you find a vehicle you like, check owner reviews for prior model years to see if they report any sunroof problems. The Honda Civic was named the #1 best small car by U.S. News and World Report in 2016, and for good reason: It has great fuel economy, a high-end interior, a smooth ride and stylish looks. A one-touch power moonroof is standard on several models of both the coupe and sedan, starting at $20,850 for the LX-P coupe. Kelley Blue Book calls it 2016’s best subcompact car for resale value, but why would you want to give up a car that’s so fun to drive? The Fit’s one of the most affordable cars with a sunroof/moonroof. The EX trim starts at $17,800 and includes not only the power moonroof but also high-tech features like Honda LaneWatch, push-button start, and HondaLink Next Generation smartphone integration. Named the #2 subcompact car by U.S. News and World Report in 2016, the Fiesta is as cute and colorful as an Easter egg, with a slew of fun features inside and out. “Blessed with tight, responsive steering and a nimble feel, this little Ford is a hoot to drive, even if you’re just zipping to the supermarket and back,” Edmunds raves. A power moonroof is optional on SE, Titanium and ST models, adding $795 to the $15,320 (2016) starting price. The Sonata is U.S. News’ pick for the best midsize car in 2016. Although the base model starts at just under $22,000, it feels like a high-end car on the inside. If you want a Sonata with a sunroof, you’ll have to choose the Limited model and pay an extra $3,100 for the Tech Package. The good news is, you get a stunning panoramic sunroof plus other luxury touches: premium audio, ventilated front seats and a navigation system. The Kia Soul is a fun little SUV, and the optional panoramic sunroof makes it even more fun. The sunroof with power sunshade spans almost the entire roof of the Soul, bringing light to the back seat as well. A speed demon it’s not, but the 2016 Soul gets good marks from reviewers for its upscale and roomy interior. The panoramic sunroof can be added to the Soul as part of the $2,800 Primo package, which includes heated front and rear seats, a heated steering wheel and other nice touches. U.S. News named the Tucson its second best compact SUV of 2016, “with the best combination of positive reviews and long-term ownership costs in its class.” A panoramic sunroof is only available on the top-level Limited trim, starting at $29,900, if you add the Ultimate Package. But you also get a ton of safety features with the $2,750 package, including lane departure warning, automatic emergency braking and rear parking sensors. Its boxy looks aren’t to everyone’s tastes, but the Ford Flex is straight-up one of the best SUVs with a panoramic sunroof. It’s so big, Ford doesn’t even call it a sunroof; instead, it’s a “Multi-Panel Vista Roof.” A power moonroof covers the first row, the second row has two windows and the third row has a skylight. Too much sun? Don’t worry, shades are included. 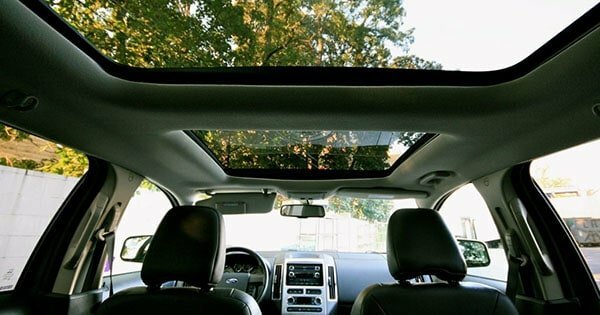 This panoramic sunroof is optional on the SEL and Limited trims. Whichever car you select, know that you’re getting the best deal on your car insurance by comparing options. 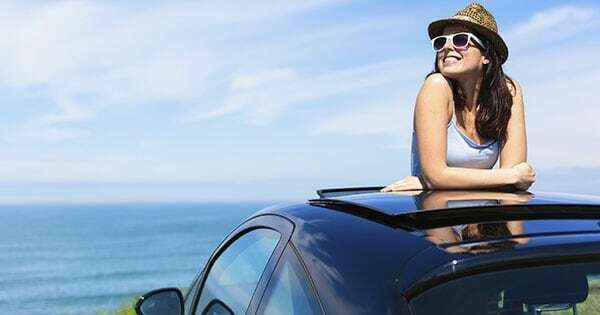 We can help you compare dozens of rates in just a few minutes, giving you more time to let down your hair and enjoy cruising with the sunroof open.